standing on wing, rear (l-r): Hudson, Rowden, Sidnell, Inder. 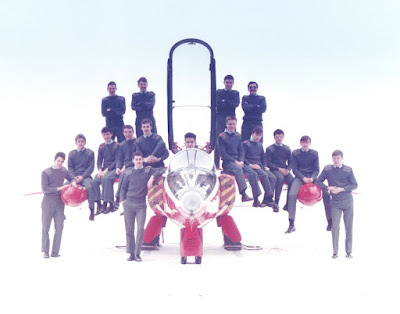 sitting on wing (l-r): Ball, Bell, Quigley, Wells, Roberts (cockpit), Darrington, Boyle, Lefly, Philips. standing (l-r): Morris, Ward, Griggs. This picture was taken at the time of completing our airfield training, very close to passing out from the apprenticeship. It was taken on a snowy, cloudy day so the whole background has faded to white, giving an impression we are actually floating. Not even we were good enough engineers that we cuould make a Gnat float . . .